Animals communicate non-verbally, communicating and receiving information telepathically or intuitively. An example of this would be a dog knowing when their owner is on their way home, or sensing that their owner is unhappy or unwell. They communicate to us in pictures and feelings, and are able to receive our thoughts and feelings. Most animal owners with a close connection will be receiving thoughts from their animals, possibly without even realising this. Hearing what your animal has to say can be incredibly comforting and also empowering for both the animal and the owner, especially in situations where there is obvious outward distress. What is telepathic animal communication ? Animals are receiving our thoughts and impressions naturally, but for us to consciously receive theirs it requires us to become open and sensitive, to be in a heart centred place and a still state of mind, so that our intellect does not override the incoming impressions. This can be difficult as we are trained in society to value our intellect more. Yet if we want to communicate with animals in this way, it is important that we trust our intuition. Animal communicators are people who consciously tune into this innate ability, enabling them to talk to and hear animals. Communication takes place through an exchange of pictures, feelings, thoughts and sensations, which is why this way of communicating is known as "telepathic animal communication". It is sometimes called "interspecies communication", as it transcends all species barriers. To be in touch with animals in this way is truly mind-blowing and an incredible heart opening experience. Amy will connect with your animal at a distance, from her home. She does this through receipt of a photo and details that enable her to connect to your animal’s energy. No time constraints are in place once the communication starts. Communications usually last from 45mins – 1 hr. Through a telepathic dialogue, Amy communicates and listens to what your animal would like to share; specific questions may also be asked. The dialogue is written down and a transcript will be sent to you. You will also be given an opportunity to call to discuss the communication. Contact Amy and she will compile the necessary details for the session. Once payment is received Amy will communicate with your animal companion and send you the transcript. You will be given an opportunity to call Amy to discuss the communication if you so wish. 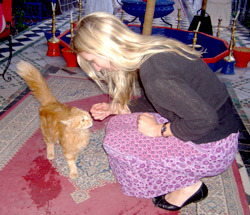 If Amy believes that clarification is needed or that it is important for the person to give a response to the animal, she will connect with the animal again. Amy’s priority is that both animal and person feel heard and honoured. To pay by cheque please email amy@gentlehealing.org.uk to obtain payee information and mailing address. Disclaimer: For health concerns, it is recommended that you contact a veterinarian. Information provided and personal consultations aim to facilitate health, and well-being and are not a replacement for traditional veterinary care.